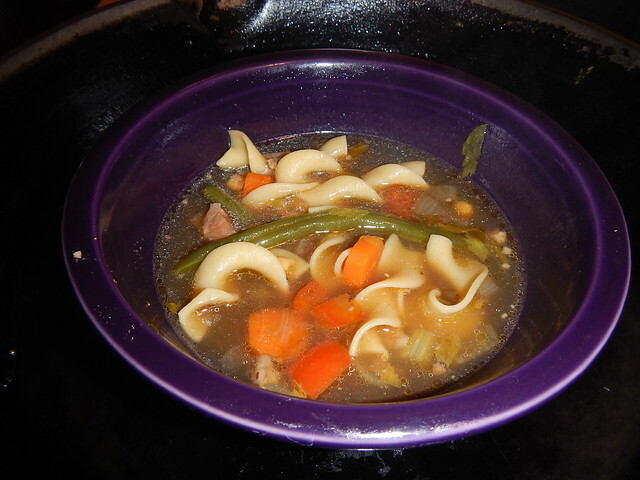 I almost always have a pot of something simmering on the stovetop. It always starts out as a carcass from some critter or the other, destined for further awesomeness. A turkey or chicken foot or two added at this time makes for the most gelatinous broth, with an amazing mouth feel and taste. I like to simmer the bones with just a little apple cider vinegar and salt to help draw out the minerals, for a long time, like 48 hours or so. I think it’s so important for strong bones. Remember when I broke my back? (Ugh.) But they told me after three months when they did the follow-up x-ray that I had the bone growth of a 14-year-old boy. I was 46 at the time. I credit all the bone-broth stock I’ve been making for years and years. 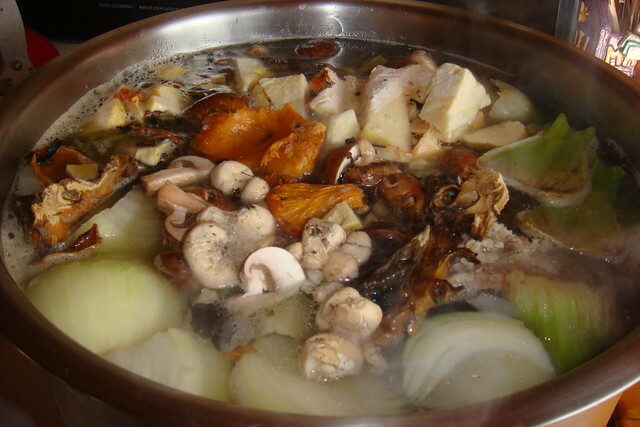 Then, I add the stock fixings: onions, celery, carrots, bits of every veg scrap we have, peppercorns, a few bay leaves, tons of dried mushrooms and let that simmer for another day or two. Clearing the table and there are green beans left over? Into the pot they go, along with carrot and onion peelings for the next few meals. When it’s time to make the soup, I strain that broth and give all the pulp to the dogs and birds. I usually pull off at least 7 quarts of stock, because that’s how many fit into my pressure canner. Then with the stock that’s left, I start over with the new veg for the soup — onions, mushrooms, celery, carrots go in first, along with some meat from the carcass. Today it was turkey. After that simmers for just a bit, I add whatever starch I want. Today it was egg noodles, but sometimes it’ll be potatoes or rice or barley. That’s when I add veg from the freezer and my cupboard. Today it was frozen green beans and home-canned corn. Cook the starch just until done, right in the soup pot. We’ll get three or four meals worth of soup, plus will freeze as many more for future meals, then start the process over all over again with the next carcass. I love making bone broth! My wife isn’t as enamored of the way it perfumes our house as I am, so I tend to only go 24 hours or so. You mentioned the pressure canner, so are you cooking your bones (etc) under pressure, or just using that as a stock pot? Stock has to be pressure canned unless I freeze it, but since my freezers are always full, pressure canning it is!